I like to photograph themes. Because of that, I have 8-9 ongoing ‘long term self assignments’ that are tucked away in the back of my head. Whenever I have a camera in my hands, I am on the lookout for my themes in addition to the subjects at hand. These growing bodies of work have become interesting personal collections and they include: shadows, silhouettes, human hands at work, reflections, signs, abstracts, motion, panoramas and dogs. Yes, DOGS! Wherever I travel, I photograph dogs with personality. Many are strays but some are pets. This week’s image was made while camping in Namibia. Toffee belonged to our guide and his wife. She has been a member of their family for many years. Toffee accompanied us on our two day camping experience. She arrived at the campsite perched on a stack of bedding in the back seat of our guide’s wife’s truck looking like a little princess on a royal throne. 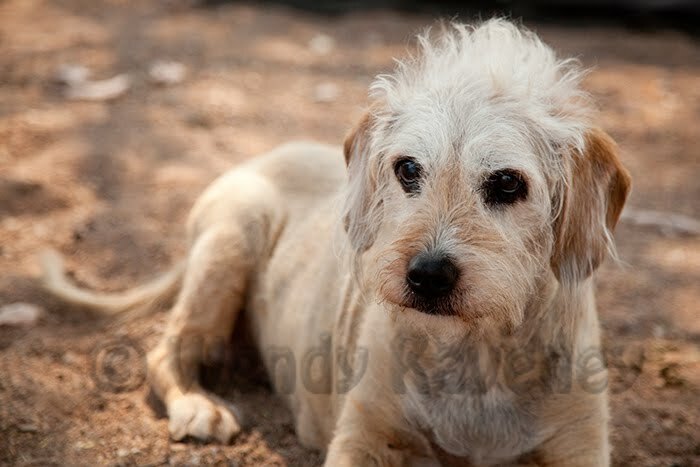 Like many dogs, Toffee did not escape the ravages of aging and happened to be blind and deaf. However, she was content to use her other senses to enjoy the great outdoors. Our guide and his wife treated her as a member of the family and the love and care they showed her was abundant and admirable. Toffee had her own little bed inside our guide’s tent, and during the day she enjoyed lying around the camp and enjoying the outdoors beside her ‘mother.’ She was at our guide’s side during the set up and break down of the campsite, during our meals at which time she was treated to bits of human food, and also after dinner when the two of them shared some ‘snuggle time.’ One could tell that even with her limitations, this dog was truly content. A few months after our return from Namibia, we received the news from our guide that Toffee’s condition had deteriorated and they had to make the difficult decision to put her to sleep. The photos we made of her during these two days were the last images made of her during her life. We shared these photos of Toffee with our guide and his wife to help keep the memory of Toffee alive. If you want to view more of my dog images, please visit “For the Love of Dogs” at wendykaveney.com.